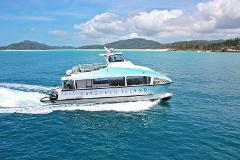 Travel directly from Daydream Island to the world famous Whitehaven Beach, cruising amongst the beautiful Whitsunday Islands. Launched in 2019, your vessel was purpose-built for Daydream Island guests. Get the adrenaline pumping, hire a jet ski and explore the Whitsundays! Take a short boat ride over to South Molle Island, a neighbouring island with National Park tracks and secluded beaches.